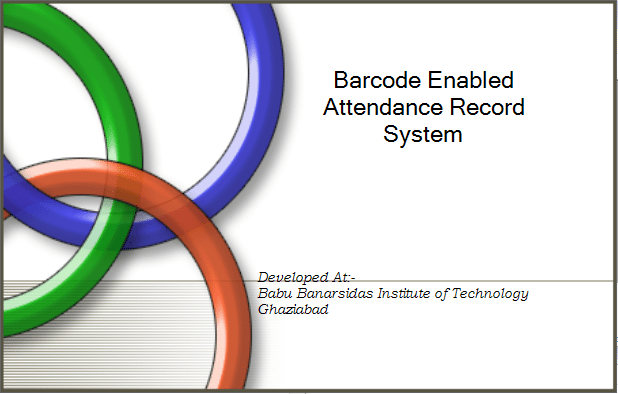 This project just gave us a chance to canalizes our efforts to develop a hardware interaction software project namely “Barcode Enabled Attendance Record System (B.E.A.R.S. )” to mark the attendance of employees in an organization automatically with the help of barcode device. Each one of us showed a great zeal towards developing this software.So hereby we present our effort in a lucid yet attractive style and hope that it will be of use for those concerned. This Software Project has been created using the Visual Basic 2005 (also known as Visual Basic.NET 2005). Using this software we can record attendance of employee with the help of Barcode Device and also can manage their records in an organization. The attendance of employee can be easily recorded with the help of this software and a separate barcode device, for this purpose we need to trace each barcode and this software will help to record the attendance of that particular barcode owner for a provided date. The most attracting feature of this project is mentioned above moreover there are number of facilities included in this software project viz. we can manage their previous attendance records, add or remove the employees as they join or left organization and many more features. Whole software can be accessed only by the supervisor also provided that supervisor needs to present the correct password, this feature enhances the security in our software project and so, no one can misuse it for recording attendance.